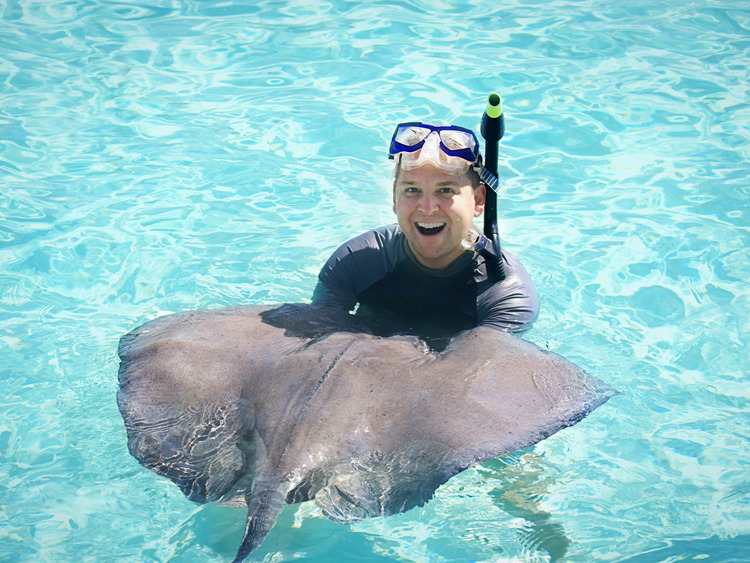 An exciting close encounter with incredible marine creatures: rays! This excursion, which includes a swim with rays and a snorkeling session to explore the marine fauna, was included by National Geographic among the Top-10 Mayan-Themed Family Activities. An opportunity not to be missed where we also have time for a little shopping. We leave the cruise liner terminal by taxi and in a few minutes we reach Stingray Beach. Before we start our swim, we are given a safety briefing and suggestions by the establishment personnel on the best way to interact with rays. Once we are in the water, the establishment personnel will gather a small group of sociable rays that cannot resist the temptation of food! The encounter becomes very exciting: the rays come close enough to swim around our legs. Looking closely we can see the rays' tail stingers that have been filed down for the safety of swimmers nearby. Thanks to this precaution, we are allowed by the personnel to touch the rays as they swim around us. These extraordinary creatures are tame enough to be pampered and they look as though they like it as we stroke their silk smooth skin and gently tickle their bellies. After our encounter with the rays in their protected area, a snorkeling session awaits us in a designated area off Stingray Beach. Here we swim surrounded by multi-coloured marine fauna, rays, parrotfish, starfish, crabs and sometimes octopus between the rocks. * After of our swimming we can enjoy a break at the Seaside Club, relaxing with a cold drink. We can also order Mexican specialities or a snack at the bar (not included in the excursion price). * A free taxi will be waiting for us at the exit to take us back to the centre of Cozumel, where we can do some shopping before returning on board. A local guide will provide general information in English. Guests must be in good physical health and good swimmers in order to participate in this tour.? Minimum age: 4 years; minors under 18 years of age must be accompanied by a paying adult.